Pork hock terrine (水晶肘子) - basically the same as 肴肉 in Shanghainese cuisine. Spiced roasted yellow croaker (五香魚) - this was not bad, and again like the Shanghainese smoked fish (熏魚). 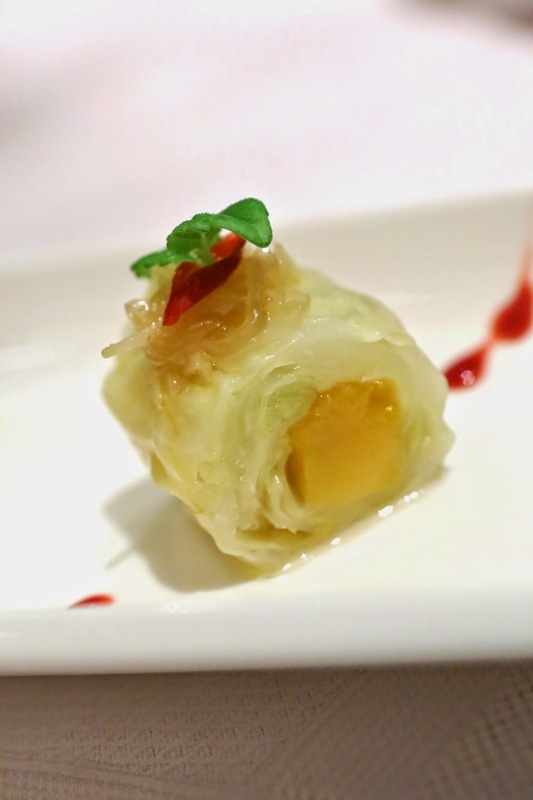 Sweet and sour cabbage with chili vinaigrette (珊瑚白菜卷) - with a chunk of mango in the middle. Tossed jellyfish head with vinegar and garlic (老陳醋拌海蜇頭) - the best of the quartet. 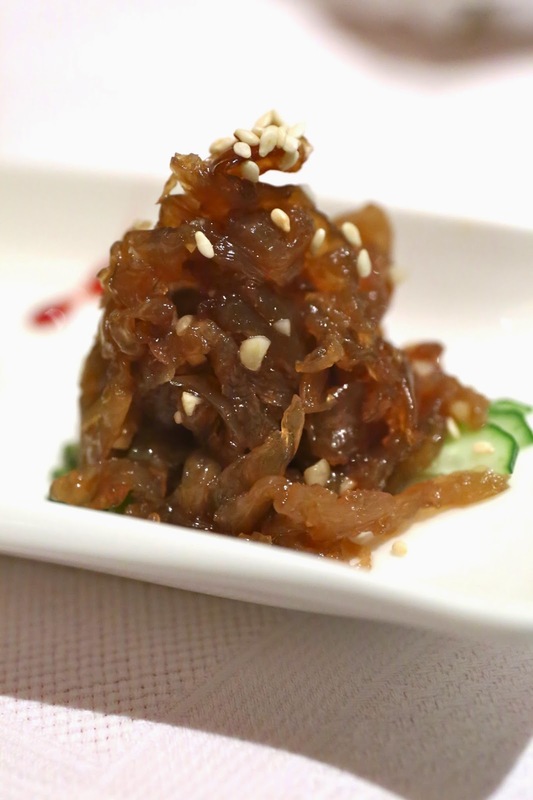 The crunchy texture of the jellyfish head became more manageable once it's been shredded, and the sharp acidity of the aged vinegar really served to sharpen one's appetite. Fresh clam and jasmine in chicken soup (茉莉海蚌清雞湯) - if one just casually sipped this soup, one could easily dismiss it as ordinary or even bland. But this soup - simmered for 8 hours with old free-range chicken, old duck (老母鴨), Jinhua ham (金華火腿) and conpoy (干貝) and strained so it is served clear - is perhaps stylistically the Chinese equivalent of the Japanese ichiban dashi (一番出汁). The flavors are so delicate here, except for a kick from ginger that was stronger than I expected. I compared this soup to consommé, although consommé can be richer in terms of flavor. A few jasmine buds floated on top. Stewed fish maw with crab claw in supreme chicken broth (蟹肉黃燒魚肚) - the polar opposite of the last soup. Intensely rich in terms of flavor, thick and viscous thanks to the collagen coming from cooking the fish maw for up to 12 hours. The crab meat naturally paired well here. The pieces tonight were pretty big chunks, and they've been deep-fried at low heat as part of the re-hydrating process. Broiled beef sliced served with sesame puffs (京蔥爆牛肉配燒餅) - classic Pekinese cuisine... and a very homey dish, too. Flavors were all there. And I love stuffing this into crispy sesame pockets. Stir fried bok choi (清炒小白菜) - so young. So tender. Traditional sweetened yellow pea cake (豌豆黃) - not too sweet. Traditional white kidney bean cake (雲豆卷) - so named because it looks like a cloud. 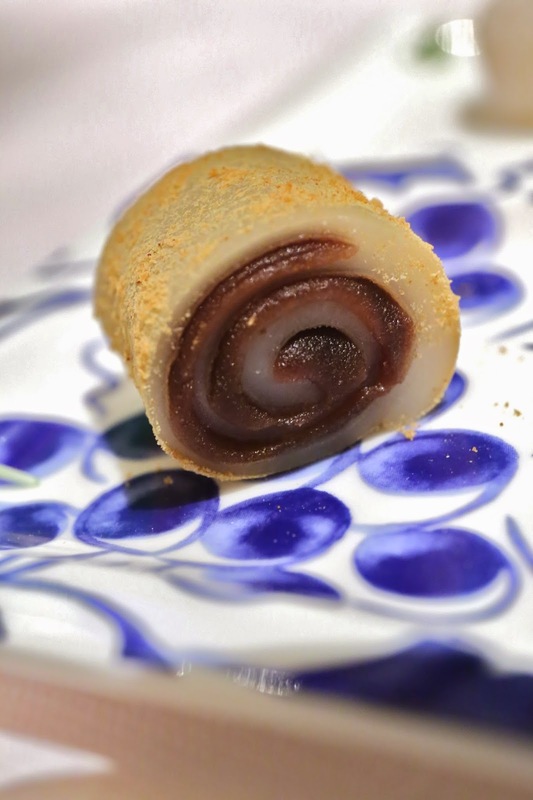 Glutinous rice roll with red bean paste (驢打滾) - so named because the soya bean powder on the exterior looks like the yellow earth stirred up by donkeys rolling around on the ground. Thankfully this was not a huge dinner like the one we had last night. The only dish that I thought was way, way too much was the fish maw - which was also the most expensive item we had. But I am grateful to have gotten a little taste of Tan cuisine. Many thanks to Wynn Macau for the treat, and I'll look for more opportunities to come back to dig a little deeper.